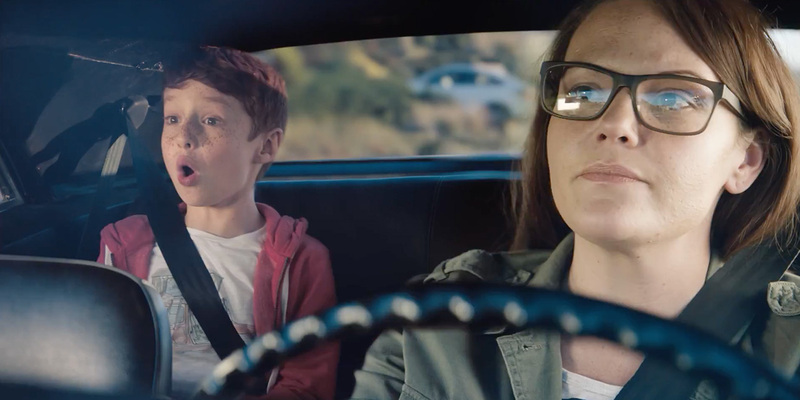 Hot Wheels aren’t just toys, says a new ad from Mattel and BBDO San Francisco. The little cars can help kids learn, too. To make that point, a mom and her young son peel out in a life-size yellow muscle car, and do a little life-size stunt driving. They dodge the spray from an open fire hydrant, and a bunch of barrels tumbling off the back of a truck into the middle of the highway. Mom talks the kid through the importance of overcoming challenges by persevering and being flexible. Eventually, they come to what seems like a truly insurmountable challenge—a huge jump over the gap in a half-built bridge spanning a canyon. “I don’t know, Mom, that looks too big,” says the kid. “There’s only one way to find out,” she replies, before gunning it toward the ramp. Spoiler alert: It turns out to be too ambitious. Luckily, if unsurprisingly, the entire sequence is make believe. As the car plummets toward the side of a mountain, the ad cuts to the kid’s room, where he and Mom are hard at play in the middle of an elaborate obstacle course he’s built—and his collection of Hot Wheels. It’s a persuasive argument insofar as imagination and focus and persistence can be useful skills, and that fun activities—like playing with toy cars—can foster them, to a degree. Part of a new “Challenge Accepted” campaign, it continues the Hot Wheels tradition of blurring the lines between miniature and real life. It lacks some of the jaw-dropping appeal that the brand had been cultivating among grown men (or man-children) in recent years with stunts like giant record-breaking recreations of classic Hot Wheels tracks. But the somewhat wooden rah-rah nature of the new ad is certainly forgivable given that the target audience includes the brand’s core demographic—the ad will break during American Ninja Warrior, and is aimed at catching parents and their offspring together. Which is good, because it means the adults can also explain that sometimes it’s better not to drive your car off a giant cliff too.